Solar Power Australia design remote area, stand alone or autonomous power systems to provide the power needs for households or businesses in regions where connection to the electricity grid may be cost prohibitive. With a power system from Solar Power Australia you can be sure you have the highest quality components offering the best performance and life for your investment. Our standard systems incorporate inverter chargers in lieu of an inverter only. This is a more elegant and hassle-free method of incorporating a battery charger into the system and can often be more cost effective than purchasing the inverter and charger separately. A battery charger allows the system to be topped up from a back-up generator if required. Our inverter chargers can automatically start and shutdown compatible electric start generators as the system requires. The above indicative pricing includes installation in NSW for most house types. This pricing includes GST. The final price has ‘Solar Credits’ funding taken into account. A price of $37 per STC has been used in the indicative pricing, and this value may vary. The actual STC’s discount that would apply would be determined when the system has been completed. 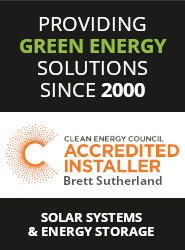 Our pricing includes processing of ‘Solar Credits’ and follow up.